Solari e-News focuses on communication issues surrounding the energy industry. 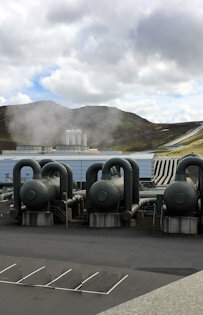 Geothermal condensers at the Hellisheidi Power Station in Iceland. The power plant generates electricity and hot water. Forward to a colleague who can benefit. Want more? Join our list. Subscribe. Our passion is simple, clear communication. Read Rich’s bio. Copyright © 2017 Solari Communication. Nothing like it has ever been attempted before. The California Public Utilities Commission (CPUC) staff is proposing that the majority of state utilities and other load serving entities (LSEs) develop integrated resource plans, which will then be used to create a statewide IRP with a foundational preferred system plan. This proposed process essentially encompasses two iterative IRP cycles, which would then be repeated every two years. Consider statewide needs and balance them with the needs of the individual LSEs. Attain a 50% renewable generation penetration by 2030. Reduce 1990 greenhouse gas emission levels by 40%, also by 2030. Meet a number of state policy goals (such as demand response, energy efficiency, and alternative-fuel vehicles). Maintain reliability and minimize bill impacts—of course! And the stakes might soon be heightened. The controversial Senate Bill 100, currently pending before the state legislature, would raise the 2030 renewable generation level to 60% and set a non-binding target for all renewables by 2045. Our most recent blog post, A Statewide Approach to Integrated Resource Planning (or PDF), discusses the CPUC proposal in greater detail. Hawai’i also has a target of 100% renewable generation by 2045; that target is mandated. The Hawaiian Electric Companies, the state’s largest utility, recently filed their resource plan and a companion grid modernization plan for attaining that goal (which we’ll discuss in our next e-News issue). The difference, however, is that Hawai’i, as a state, is relatively small and isolated; California boasts a diverse economy, the sixth largest in the world. The CPUC proposal still requires acceptance by its Commissioners. Regardless of that decision, SB 350 is still law, so these goals will eventually be met. Something to keep an eye on. Poor writing costs. Billions. Every year. In several reports, Accenture found that poor product documentation costs the United States and Europe about $25 billion annually. About two-thirds of all products returned as problematic have nothing wrong with them. The biggest reason for their return? People can’t figure out how to use them. A recent entry on the Daily Best website portends that the actual cost is closer to $400 billion. In my experience, much of the problem lies with three factors. The first is an assumption of a certain knowledge level of readers that just does not exist. In other words, the reader just doesn’t understand. The second assumes a much higher reading level than most people can attain. Third, and probably the most insidious, is writing so vauge, intentional or otherwise, that it simply defies comprehension by any level of reader. The solution: write clearly, write simply, and write for your audience. Need help? Contact us. We hope you find our e-News interesting and informative.